After only a few years, Frank (with aid from his father, Dario) purchased Luigi’s Pizza on Stockton Blvd in 1963. Once established in business, they sent for the rest of the family, including younger brother Celso. Celso had the opportunity to graduate from Sacramento State College with a business degree, which he was able to put to use in the business as a manager at the original location. Today, one generation later and into another century, Luigi’s stands as one of Sacramento’s legendary eateries. It encompasses, embraces, and defines the terms tradition, institution, heritage, and legacy in a single establishment. Luigi’s sphere of influence expanded to the midtown region on 20th Street at J Street in 2007. One of Frank’s sons, Greg, had the idea of taking Luigi’s into a new environment. “I always had this idea of putting a slice place together,” Greg Brida said in a recent interview. “I grew up in the business with my father,” he continued, “…so I wanted to bring his product into a high traffic area, into mid-town.” Timing is the arrow of fortune; when there was a temporary void in Greg’s career, the time became available to establish Luigi’s Slice. Right time; right place. 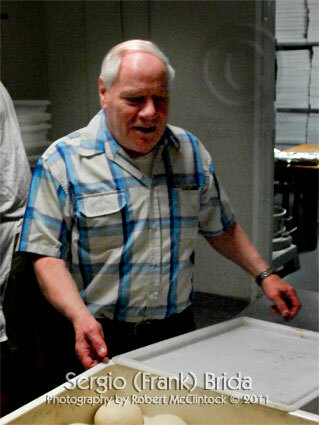 Greg soon thereafter bought the original site from his father, Frank, in 2010. Frank is now semi-retired, but Greg says he still shows up at work every day “to check on things.” After 45 years running a family business, who could walk away completely? 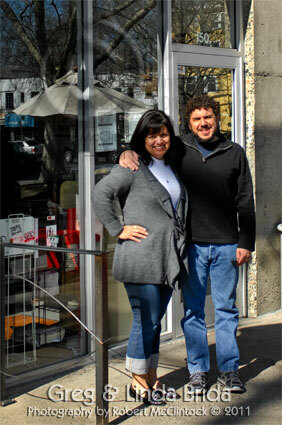 Greg and his wife Linda now own both the “Slice” and the original shop on Stockton Blvd. and have minority partners and managers to help run both places. Loyal patrons at the original place continue to see manager Scott Waterbury, who attended the Culinary Academy and learned the trade under Frank and, of course, Celso. Location, location, location. That has always been an axiom for a successful business. Yet the Stockton Blvd. establishment has long been notorious for having almost no parking. Greg responded to this: “On a busy Friday night, you’ll see cars all over the place.” And still, people fill up the restaurant. So much for that theory: serve a great product, and do it consistently, and “they will come” as the movie says. Recently, some of the old buildings on Stockton Blvd. next to Luigi’s were razed, giving way (in dry weather) for expanded parking—at least for now. Linda added that there is a similar problem of sparse parking at midtown, yet people find a way of getting there. She likes to tell of Frank’s first reaction to the new Luigi’s. “Frank thought Greg was crazy,” she said. “No one would buy just a slice of pizza.” Greg understood where Frank was coming from, because Frank had seen many restaurants fail over the years. Linda followed up, “But his (Frank’s) jaw did drop when he went to the first Second Saturday and saw the lines out the door.” “Whoa, and mine did too,” said a very happy Greg. Luigi’s Slice was the first retailer to sign a lease in Mike Heller’s development on 20th Street, an area that had been warehouses and then state offices. Greg had liked the look and feel of Blondie’s Pizza in Berkeley with its narrow layout and high ceilings and had hopes of creating something like that here. Heller and Greg, both visionaries, saw promise in the midtown location before it became a magnet area for Second Saturday. After the success at the “Slice” in its first retail space, the occasion availed itself to lease the neighboring space. 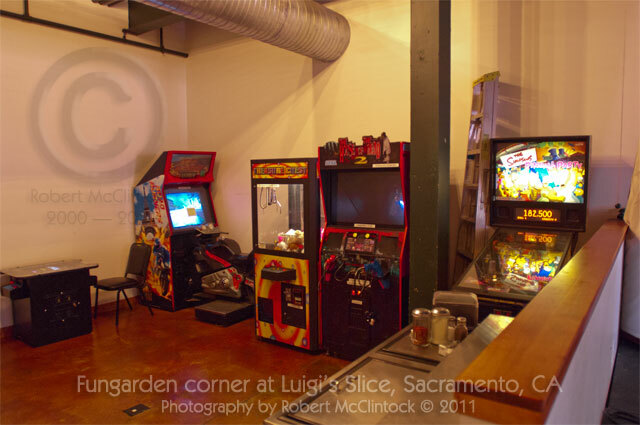 This was the opportunity to do two things: one, to setup a “fungarden” like the original Luigi’s—a place for some arcade games and for private parties—and two, to foster the independent (indy) music scene of which Greg has been an avid follower. With ABC (Alcohol and Beverage Control) approval, both have been a success. 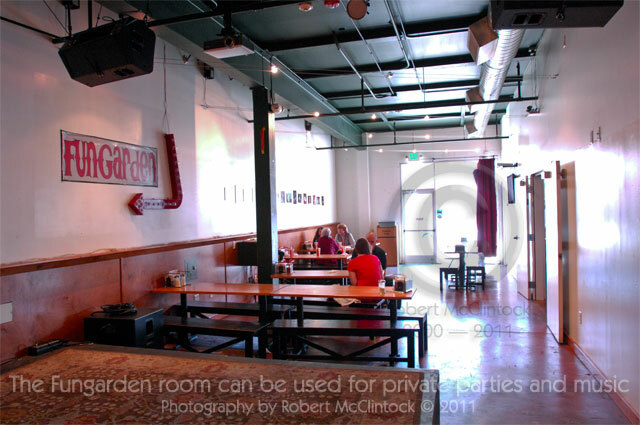 Although the floor plan of the additional space might have worked for big screen TVs and sports, after thinking about it, Greg’s feeling was that mid-town is not a big sports neighborhood, but one more on the artsy, music, and fine art side. There are many aspects to running a business of any kind that the average customer simply does not see but can appreciate in the final product. It is easy to take for granted the hard work up front and hidden hours of labor just in the pre-preparation of the menu. 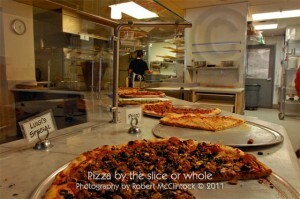 Each pizza is a handcrafted work of, well, art that begins in the early morning. 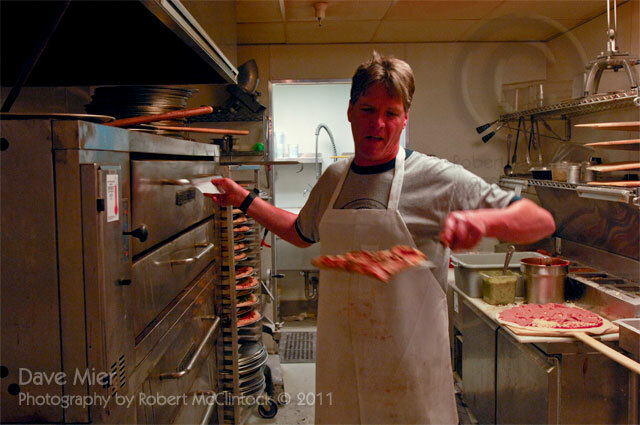 A couple of years ago I visited the original location and watched as Scott Waterbury began about 9:00am with huge slabs of dough—that had already been prepared from scratch (see the second audio slideshow)—and cut it up and rolled the pieces into many round loaf-like balls. All of these were later hand rolled into pizzas AS the orders were placed throughout the day, making each pizza fresh. The cold storage room was filled with grated cheeses, produce, and toppings that had also been prepared in advance and on a daily basis. On average, Luigi’s orders about 1750 pounds of flour per week, and they themselves make about two 5-gallon buckets of sauce per day. Luigi’s is famous for its homemade sausage. Greg wore a smile when he spoke of his Dad still being involved in the making of the sausage. “He owns the secret recipe.” He added, “Almost everything is made from scratch. Nothing is premade except salami and pepperoni, obviously, but the produce is all fresh, we make the sausage, sauce, lasagna, and salad dressing, and prepare the beef that goes on the pizza.” Though the “Slice” location doesn’t YET serve pasta, they will eventually; meanwhile, they do serve their popular pastrami and meatball sandwiches, and pasta is still served at the original location on Stockton Blvd. Working for Luigi’s is no casual experience. Employees go through on-the-job training for at least six months before actually making pizzas. Training includes doing the prep work (preparing toppings and sauces, grating cheeses, etc. ), learning to put a pie together—remember, consistency is everything, along with taste and a few other things—and learning to understand the ovens and their hot spots. 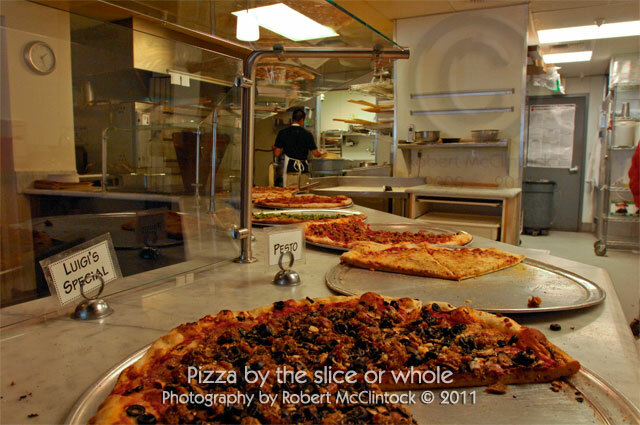 Luigi’s Slice is situated in an eclectic part of town, with a big variety of clientele. It neighbors up to the area known as Lavender Heights; there are the independent music scenes, and a few popular bars, plus they have a regular UC Davis bunch. They stay open until 2:30am Fridays and Saturdays to accommodate the after-hours crowd. 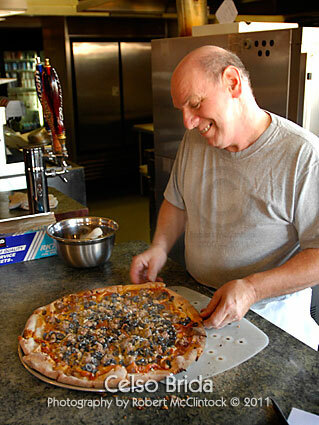 Luigi’s Slice continues in the family business and the family tradition. Kids, grandkids, nephews, nieces, aunts, and uncles all have worked there or still do. It not only provides financial opportunities for family members, it gives them opportunity to work, to learn “how” to work, and to learn the responsibilities and ethics of work. It doesn’t take long to see that Greg and Linda Brida are not just nice people but that they are also good people, raising a good family. On 20th, between J and K Streets. Copyright © 2011 by Robert McClintock. All Rights Reserved. This entry was posted in Commentary, Documentary, People, Photography, Travel and tagged carmichael, journey, luigi, mcclintock, photo, photography, pizza, robert, sacramento, slice by Vanessa. Bookmark the permalink. Thanks Dale. Betwixt you and me, I do prefer “my house.” Glad you took a look.